The opening of We Happy Few shows a lot of promise. The game’s universe takes place within an alternate timeline stemming from a version of World War II, and stars Arthur Hastings (one of three playable characters), who works as a “redactor” in the small town of Wellington Wells. Your job as Arthur is simple: redact news clippings and decide what should be approved, archived, printed, recycled or simply forgotten. You come across a news piece that jogs the memory of your past, and you’re faced with the choice to take a hallucinogenic drug called “Joy,” which suppresses all unhappy memories and leaves its user in a chemically-induced euphoria, or stop and see the world for what it truly is. From there, things spiral out of control — and I don’t mean in the story, but the actual game itself. As you’ve probably heard by now, We Happy Few is a bit of a mess. I’m usually not this frank about the quality of a product, but this game, in particular, requires it. I actually wish I could take Joy while playing We Happy Few, since I think the effects of the pill may ultimately paint this game in a better light, or at the very least provide a shred of happiness from the painful, stale, and incredibly unfinished product that it is. Needless to say, as a reviewer, I’m going to try and explain as best I can as to why you should think twice before deciding to play the game, nevermind spending your hard-earned cash. The first minute or two of We Happy Few is actually really fascinating and what ultimately drew me to the game in the first place two years ago when I saw the trailer at E3. The concept of distilling happiness and concentrating it into the form of a pill to hide the depravity of reality is brilliant. I was fascinated by the premise, and as a gamer who enjoys questioning morality within gameplay, I truly thought that’s what the game was all about. I was wrong. We Happy Few is a substantially unfinished game. The mechanics are incredibly disjointed and at times, often disorienting. I actually had to take multiple breaks from playing and step away from the screen because the movement of everything gave me motion sickness. The X and Y axis of the camera, for example, is inaccurate and often moves at different rates, and while you can adjust it from the options menu, no matter how much I fussed with these controls, the problems did not go away. After the cold opening (which is essentially the playable teaser shown at E3), you are immediately met with some of the most atrocious gameplay you will ever encounter. It’s also quite boring. 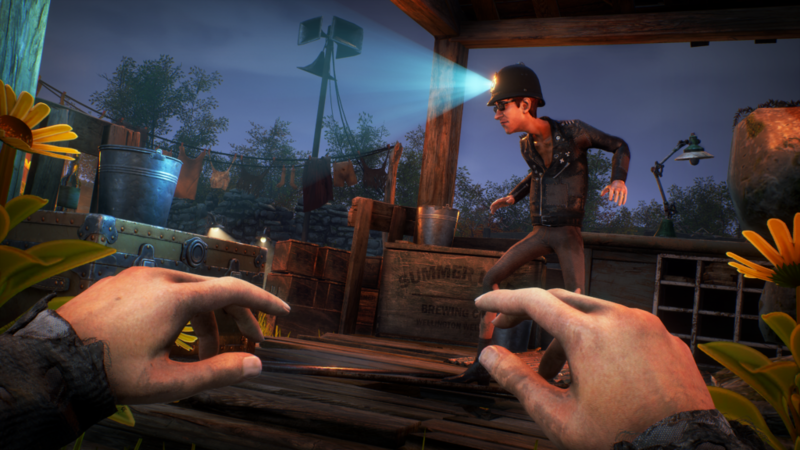 Players are promptly advised to collect objects like hairpins and rags from clearly copied-and-pasted interactive environments, and are then encouraged to start crafting, which has the air and feeling of an old survival or zombie game of a decade ago, making this game feel noticeably out of date. The biggest identifier of We Happy Few being an unfinished product, however, is in the behavior and variety of its NPCs. There are indeed few of them. They also frequently clip through the floor or other environments, and react totally independent of what’s supposed to be happening. At one point, I was tasked with sneaking into an encampment of sorts, and somehow glitched my way in by walking through the back door. Combat in We Happy Few is frantic, disorienting, and inconsistent (much like the rest of the game), and is so chaotic that it feels like you have no control over what is happening. The NPCs and enemies also have an insane (and I mean insane) hitbox detection. Even worse, there’s a ghastly amount of combat — which would be fine if it actually worked well. Once completing combat, you have the choice to keep interacting with their dead bodies to search them for items, but you may also pick them up, carry, or throw them. These dead bodies clip, wriggle, vibrate, and continue to move awkwardly on their own, similar to something you’d find in Goat Simulator. In fact, the most fun I had playing We Happy Few was carrying these dead NPCs and throwing them around. And that’s not saying much. 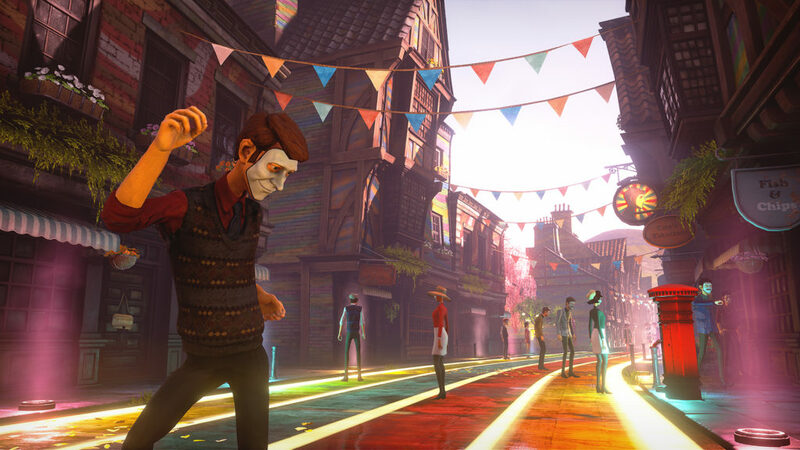 One bright side to We Happy Few is that it has the so-bad-it’s-good aesthetic, that I can see how played after a few drinks, it might conjure up its own hilariously demented reality. Unfortunately, We Happy Few will also probably go down in gaming history as a horrible game and a product that shouldn’t have been released as is. If you do ever come across this title in a discount bin, I would recommend giving it a whirl, since you might just get a kick out of playing, if only to stare in utter disbelief at the atrocity that it is. Very good review! A bit surprised by the score but it’s seems fair in the end, I’m only dissapointed that this game seems to have a compelling aesthetic and setting but falls short in every other aspect. hard score for a game unifinished ok , but good.